Objective Walking interventions in healthy populations show clinically relevant improvements for many cardiovascular disease (CVD) risk factors. We aimed to assess the changes in CVD risk factors and the dose–response relationship between frequency, intensity, duration and volume of walking and cardiovascular risk factors based on randomised controlled trials (RCTs). Design A systematic review with meta-analysis and meta-regression. Data sources Four electronic databases searched from January 1971 to April 2017. Eligibility criteria Walking RCTs reporting one or more CVD risk factor outcomes; trials including at least one group with walking intervention and a no-walking control group; duration ≥8 weeks; participants ≥18 years old, inactive but healthy; risk factors assessed preintervention and postintervention; English-language articles in peer-reviewed journals. Results Thirty-seven RCTs, involving 2001 participants (81% women) and assessing 13 CVD risk factors, were identified. Pooled meta-analysis showed favourable effects (P≤0.05) of walking intervention for seven CVD risk factors (body mass, body mass index, body fat, systolic and diastolic blood pressure, fasting glucose and VO2max). There were no significant effects (P>0.05) for waist circumference, waist-to-hip ratio and four blood lipid variables. Despite testing 91 possible dose–response relationships, linear meta-regression analysis adjusted for age indicated just 7 (or 7.7%) statistically significant findings. Summary/conclusion Walking interventions benefit a number of CVD risk factors. Despite multiple studies and tested metrics, only a few dose–response relationships were identified and the possibility of chance findings cannot be ruled out. There is insufficient evidence to quantify the frequency, length, bout duration, intensity and volume of the walking required to improve CVD risk factors. Walking is the ideal physical activity intervention to improve health across the population.4 A recent systematic review of 32 randomised controlled trials (RCTs) by Murtagh et al 5 showed that walking increases aerobic capacity and reduces blood pressure, waist circumference, body weight, per cent body fat and body mass index (BMI). Another systematic review6 reported similar health benefits of recreational walking including reduced systolic and diastolic blood pressure, resting heart rate, body fat, BMI and total cholesterol, and increased VO2max, physical functioning and the distance covered in a 6 min walk test. National physical activity recommendations are based on summative volumes of different intensities of physical activity over a week, with walking as the cornerstone of health promotion efforts. However, walking can vary considerably in terms of the frequency, intensity, daily/weekly duration and total volume. Specific evidence on the dose–response relationships could increase health professionals’ effectiveness in promoting physical activity and specifically walking for health benefits. Observational data indicate some dose–response relationships at a population level. In a systematic review of epidemiological studies with all-cause mortality as the endpoint, Hamer and Chida7 found that walking pace was a stronger independent predictor than walking volume. Through meta-analysis, Kelly et al 8 showed an increased reduction in the risk of all-cause mortality for higher walking volumes (in MET-hours per week). Also, randomised controlled walking trials have found some dose–response relationships. Asikainen et al searched for the minimum dose of walking for health benefits and found that a weekly dose of 1000 to 1500 kcal of walking improved the aerobic power and body composition of previously sedentary non-obese postmenopausal women.9 Recently, Hanson and Jones6 noted based on their systematic review of randomised controlled walking trials that there is insufficient evidence to suggest any conclusions about the dose–response between the volume and intensity of walking and the health outcomes. CVD risk factor reduction via walking promotion must be based on evidence of effectiveness and on being able to identify the effects of variations in different characteristics of walking, potentially offering more options for walking. Based on the updated data of Murtagh et al,5 our systematic review aimed to (1) update the evidence for the effects of walking interventions on CVD risk factors and in particular to (2) study the dose–response relationships between the frequency, intensity, duration and volume of walking interventions and CVD risk factors in healthy inactive adults. Studies (1971–2012) included in an earlier systematic review5 were supplemented by electronic searches (January 2012 to April 2017) of four databases: Cochrane Central Register for Controlled Trials, Medline, Web of Science and SPORTDiscus. The following search terms were used in both searches: (1) walking, (2) exercise, (3) health and (4) cardiovascular risk. The full search strategy for the 2012–2017 search is enclosed as online supplementary file 1. Reference lists from review and original articles were hand-searched for additional studies. Studies were selected based on the following inclusion/exclusion criteria: RCTs studying the effects of walking on one or more CVD risk factors; trials with at least one group completing walking as the only intervention; intervention duration at least 8 weeks; control group with no walking intervention; participants aged 18 years or older who were insufficiently active but otherwise healthy and capable of unaided walking (otherwise no other age limit); CVD risk factors assessed pretraining and post-training (or change from preintervention to postintervention reported); English-language articles published in peer-reviewed journals between January 1971 and April 2017. Twenty-eight studies9–36 from a previous review5 of 32 studies were included in the current analyses. Two studies were excluded because of very old age of the participants37 38 and two studies because of insufficient outcome data.39 40 Screening of the previous review is described elsewhere.5 The updated search resulted in 10 new studies for inclusion.41–50 Titles and abstracts from the updated search were screened by three authors (PO, ST, PK). Full papers were screened independently for eligibility by two authors (PO, ST and PO, PK). Disagreements were resolved by jointly reassessing the studies against the eligibility criteria. Intervention dose metrics were frequency (sessions per week), duration of the intervention (weeks), bout duration (minutes per session), intensity as METs and %VO2max, and volume as MET-minutes per week and total MET-hours (conversion formulas are indicated in the respective tables).51–53 The outcome measures were aerobic fitness expressed as VO2max (mL/kg·min), body mass (kg), body fat (%), BMI (weight in kilograms divided by height in metres squared), waist circumference (cm), waist-to-hip ratio, systolic and diastolic blood pressure (mm Hg), total cholesterol (mmol/L), high-density lipoprotein (HDL) cholesterol (mmol/L), low-density lipoprotein (LDL) cholesterol (mmol/L), triglycerides (mmol/L) and fasting glucose (mmol/L). Outcomes for insulin resistance and inflammation-related serum cytokines,45 blood flow in lower extremities,46 arterial stiffness,48 postural stability,42 bone mineral density42 and biomarkers of endothelial function49 were not included in the meta-analyses because of insufficient number of comparisons (<10) (see Higgins and Se54). Risk of bias of individual studies was assessed by the Cochrane Collaboration tool.54 Two authors (PO, EMM) assessed studies independently for sequence generation, allocation concealment, blinding, incomplete outcome data, selective outcome reporting and other potential threats to validity. Divergent ratings were reassessed independently by a third author (MHM) to reach consensus. The software ‘Comprehensive Meta-Analysis’ was used for all statistical analyses.55 For each CVD risk factor outcome, standardised mean difference (SMD) (defined as the raw difference between the mean change in the intervention group and the mean change in the control group divided by pooled post-SD) was used as the summary measure. When these data were not reported, we used the reported findings as follows. For the studies by Butcher et al,17 Murphy and Hardman23 and Tully et al,33 34 we used mean change and its SD and the number of participants in each group to calculate SMD. For the study of Hamdorf et al,43 we used pre-means and post-means and the number of participants in each group and F for the difference between changes. For body mass in the study by Hinkleman and Nieman,19 the number of participants in each group and F for difference between the changes were used in the formula. Eleven studies included more than one walking intervention group. The results for each group compared with the control were treated as independent studies. The number of participants in the control group was divided by the number of intervention groups.54 The effect direction was set negative for studies where a decrease represented an improvement in the health risk factor compared with the control group, and the effect direction was set positive for HDL cholesterol and VO2max as an increase represents an improvement in health risk. The following Q statistics were used to identify and quantify the heterogeneity in effect sizes for each CVD outcome: (1) the estimated SD of the true effect size (Tau), (2) the ratio of true heterogeneity to total variation in observed effects (I2), which can range from 0% to 100% and (3) the P value to test the null hypothesis that all studies share a common effect size.55 Publication bias was assessed by visual inspection of funnel plots. If a publication bias was assumed, cumulative forest plots55 were used for confirmation. All analyses were adjusted for age. Gender was not considered a confounder because only two studies were men only. Further adjustment for gender indicated that there was no difference in the effect sizes between subgroups with women only, men only, mixed and no information (data not shown). We conducted random-effects univariate meta-regression analysis with adjustment for age using continuous walking intervention characteristics as the covariates to test linear as well as curvilinear relationships. The dependent variable was the SMD for each CVD outcome. In the regression models, the study’s weight was the inverse of the total variance for each CVD outcome. Meta-regression results are reported as the linear β-coefficient with 95% CI and P values. The curvilinear regressions between the MET-related doses and the outcomes were analysed by creating two variables (dose minus mean and dose minus mean squared) and testing if the interaction was significant. The Bonferroni correction59 was applied to interpret multiple-comparison P values. We searched four electronic databases from 2012 to April 2017 to update the data of the previous systematic review.5 The search resulted in a total of 7862 records. The screening of the titles and abstracts yielded 37 papers for potential inclusion. These were supplemented by 28 papers from the previous review5 and one paper was identified by hand searching. The full-text versions of 70 papers were then screened. Thirty-two papers were excluded due to the following reasons: mixed training content (seven), non-randomised or group-randomised design (eight), non-healthy participants (eight), no no-walking control group (three), incomplete outcome data (four) and unclear intervention (two). Thirty-eight eligible studies were included in the analyses. This included 28 studies from the previous review5 and 10 new studies. Where studies reported results using the same participants in more than one article, these were combined to represent one study in the meta-analysis. Study selection is depicted in figure 1. Participant characteristics, study characteristics and walking intervention characteristics (session duration, frequency and intensity as well as length of the intervention) for all 37 included studies are shown in online supplementary table 1. In brief, 22 studies9–12 16 18 19 21 23 26–30 42 43 45–47 49 50 60 included only women, 3 studies31 32 36 only men and 14 studies13–15 17 20 22 24 25 33–35 41 44 48 both sexes as participants. The mean age of participants ranged from 30 to 72 years. The studies included 55 walking intervention groups. Thirty studies prescribed ordinary walking, four studies treadmill walking, two studies used Nordic walking and one ‘trekking’ intervention. Intervention dose characteristics varied considerably (online supplementary tables 1 and 2): total duration 8 to 52 weeks, session duration 10 to 90 min, number of sessions per week 1 to 15.4, weekly duration 10 to 325 min, intensity 1.7 to 5.8 METs, total weekly volume 27 to 1300 MET-minutes per week, total walking duration 130 to 10 192 min and total intervention volume 5.85 to 576 MET-hours. Twenty studies reported walking intensity as either percentage of maximum heart rate (range 50%–86% HRmax),10 11 18 23–26 29 31 32 35 36 percentage of VO2max (range 45%–65%)9 12 19 20 28 45 or percentage heart rate reserve (range 54%–85%).15 27 30 Four studies reported that walking was ‘self-paced’14 17 21 22 and seven studies noted that walking intensity was at a ‘brisk pace’.13 16 33 34 41 42 48 In addition, two studies measured the intensity as walking speed44 50 and one study as HR,43 MET,46 RPE47 and ventilator threshold49 each. In 10 studies,17 21 22 24 26 29 30 43 45 47 the intensity in METs could not be derived from the information provided; therefore, intensity data are missing for these studies. Our pooled data included sufficient number (≥10) of comparisons in the meta-analyses for body mass (40), BMI (28), body fat (28), waist circumference (18), waist-to-hip ratio (13), systolic blood pressure (34), diastolic blood pressure (32), total cholesterol (37), HDL cholesterol (35), LDL cholesterol (34), triglycerides (34), fasting glucose (16) and VO2max (31). Overall, both the meta-analyses and the meta-regression analyses included 13 or more comparisons. Pooled meta-analysis results (SMD, 95% CI, P value) are shown in table 1. Significant favourable effects (P<0.05) were seen for body mass, BMI, body fat, systolic and diastolic blood pressure, fasting glucose and VO2max. Estimated effect sizes were body mass −1.6 kg, BMI −0.60 kg/ m2, systolic blood pressure − 4.05 mm Hg, diastolic blood pressure −1.76 mm Hg and VO2max 4.86 mL/(kg·min). Heterogeneity, as indicated by I2, was 0% for all outcomes except for systolic (17%) and diastolic (6%) blood pressure, total cholesterol (16%) and fasting glucose (23%). The linear meta-regression analyses for (1) walking frequency (number of sessions per week), (2) intervention duration (weeks) and (3) session duration (minutes) showed three significant (P≤0.05) positive associations from 39 possible dose–response relationships (intervention duration with LDL-cholesterol (P=0.001) and VO2max (P=0.018), and session duration with triglycerides (P=0.029)) and one inverse association (session duration with systolic blood pressure (P=0.050)) (table 2). The linear meta-regression analysis between the three MET-related metrics (METs, MET-minutes per week, total MET-hours) and the outcomes resulted in three positive associations from a possible 39: METs with VO2max (P=0.049), MET-min per week with triglycerides (P=0.009) and total MET-hours with LDL cholesterol (P=0.007) (table 3). We found one positive relationship to be significantly curvilinear after adjustment for multiple testing: intensity in METs with LDL cholesterol (results not shown). Respective linear analysis with the relative intensity dose (%VO2max) yielded one inverse association: %VO2max with diastolic blood pressure (P=0.020) (table 4). Despite multiple studies and tested metrics, only a few significant dose–response relationships between the walking doses and the CVD outcomes were identified and the possibility of chance findings cannot be ruled out. This review suggests that there is insufficient evidence to quantify the frequency, length, bout duration, intensity and volume of the walking required to improve CVD risk profile. Our meta-analysis showed significant positive impact of walking on seven CVD risk factors: body mass, BMI, body fat, systolic and diastolic blood pressure, fasting glucose and VO2max. These findings are consistent with those of Murtagh et al 5 except that of waist circumference, for which they found a statistically significant effect but we did not, and the new finding of decreased fasting glucose in the present review. Blair et al evaluated the clinical significance of their findings and noted that an increase in aerobic capacity of 10% is likely to result in a 15% reduction in mortality,61 while Lewington et al noted that a 2 mm Hg reduction in systolic blood pressure would result in 10% lower stroke mortality and 7% lower mortality from ischaemic heart disease and other vascular causes.62 As the reductions in body mass, BMI and diastolic blood pressure in the current analyses were of greater magnitude than reported by Murtagh et al,5 and there was the additional decrease of fasting glucose, the changes found in the CVD risk factors could be considered clinically important. There was no indication of publication bias in the cumulative funnel plots, but the quality of studies was variable. Due to incomplete reporting, the risk of bias in sequence generation, allocation concealment and blinding could not be assessed for the majority (76% to 84%) of studies. In contrast, low risk of bias for outcome analysis and reporting, and for other potential sources of bias was assessed for the majority (65% to 95%) of the included studies. These observations highlight the need for careful execution and full reporting of future walking trials according to the current quality criteria to ensure the validity of the findings. Adherence to the exercise protocol may have an impact on the reported outcome results. Actual adherence is likely to be smaller than intended, especially in long-lasting interventions, and the difference may lead to overestimation of the dose needed for changes. In our data of 37 studies, 22 studies reported adherence rate and 15 did not. The reported adherence rates varied between 67% and 100% with 17 studies reporting over 80% adherence. While it is possible that the non-reporting studies had lower adherence, the high rates in the majority of the studies suggest that the possible overestimation of the dose may not be substantial. We performed post hoc subgroup and mixed-effect analyses comparing studies with adherence rates over and below 90% for all study outcomes. The results indicated no statistically significant differences in any of the outcomes. Sufficient sample sizes are needed for robust results. We examined our data from this perspective by conducting post hoc subgroup and mixed-effects analyses comparing study group sizes over and below 20 (per study arm) for all outcome variables. The subgroup analysis indicated statistically significant differences between the two sample sizes for fasting glucose, systolic blood pressure and LDL cholesterol. Subsequent mixed-effects analyses showed no differences between the two groups for LDL cholesterol and statistically significant differences for fasting glucose and systolic blood pressure. Overall, the sample size affected only 2 of the 13 outcomes, which may also be due to the multiple comparisons. In our study, we have attempted to explore the dose–response between walking characteristics and CVD risk factors using meta-regression analysis. One assumption for the use of meta-regression is sufficient heterogeneity in the outcome effects, that is, some of the variance across the included studies is real. We found some (4%–23%) heterogeneity as measured by the statistic I2 in four and no heterogeneity in nine outcomes. This low level of heterogeneity may explain the fact that we found only a few statistically significant dose–response associations. Moreover, as the meta-regression analyses included multiple comparisons between the dose and the outcomes (each 13 comparisons), there is a risk of overestimating the statistical significance. A more conservative P value for our multiple testing would be between P<0.004 and 0.002 according to Bonferroni.59 All but one (weeks of intervention with LDL) of the found P values for the regressions were greater than this. We therefore did not find any consistent evidence that the response of the CVD risk factors is associated with the walking dose characteristics used in this study. The dose of walking in METs represents the absolute intensity, which confers different levels of relative physiological load across individuals with different capacity. Thus, a dose of 5 METs may mean 50% of the capacity of a person with good cardiorespiratory fitness and 80% of the capacity of a person with low fitness. This means that the METs intensity is only an estimate of the absolute but not the relative physiological stimulus. Physiological load relative to maximum is likely to be the key stimulus for many of the alterations in health outcomes being considered. We found one significant positive response (VO2max, P=0.049) for the METs dose. Maximal oxygen uptake is the gold standard for aerobic fitness. The per cent level of VO2max of training represents a good measure of the relative physiological training stimulus. We had 20 studies with %VO2max intensity (reported or converted). In all these studies, the training intensity was determined by individual heart rate monitoring (19 studies) or walking speed (one study) derived from laboratory assessment. Thus, the relative intensity dose was physiologically controlled at the group level. The regression analysis (table 4) resulted in a significant (P=0.020) inverse association between the %VO2max dose and diastolic blood pressure. As this P value does not reach the conservative significance P level of 0.004,59 the response of the CVD risk factors is likely to be independent also of the relative intensity dose. 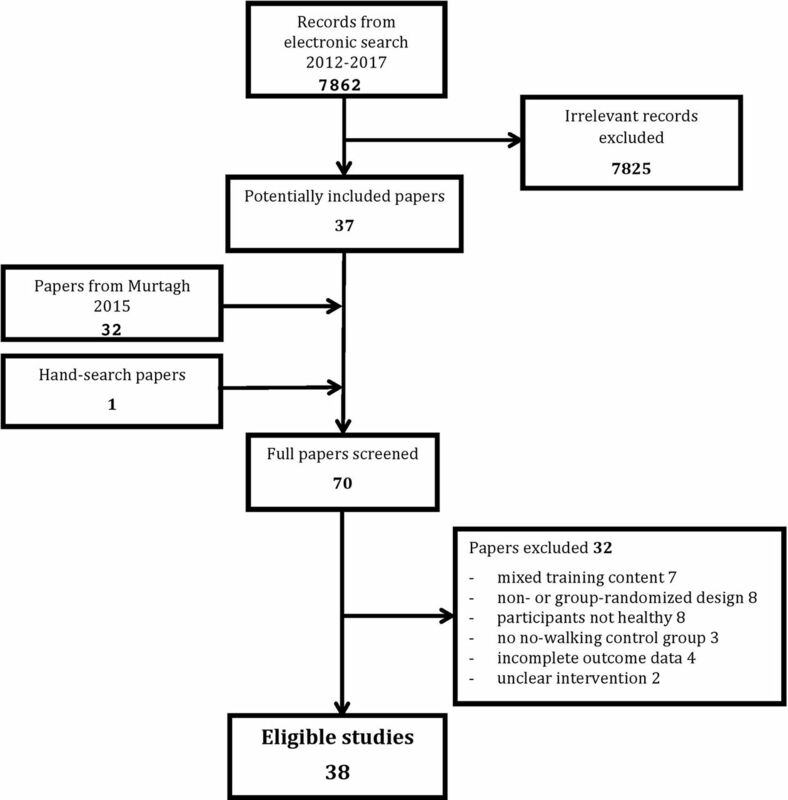 Our systematic review including 38 studies published between 1971 and 2017 identified a large number of randomised controlled walking trials conducted according to a standard set of quantitative criteria. The data set consisted of 28 studies from a previous review5 and 10 new studies. This data set included 2001 participants and 55 comparisons between intervention and control groups and a commonly accepted set of the most important CVD risk factors, allowing for rigorous meta-analysis of the main effects of walking and yielding robust effect sizes in several outcomes. Extraction of clearly defined walking dose characteristics enabled unique meta-regression analysis for the dose–response between walking attributes and health outcomes. In addition, both the linear and the curvilinear relationships were tested. To our knowledge, this is the first attempt to explore the dose–response patterns with meta-regression analysis of data from randomised controlled walking trials. The study is not without weaknesses. We were not able to perform an individual participant data analysis using the primary data for each study but relied on aggregated data across studies resulting in increasing intrastudy and interstudy heterogeneity, and potentially regression to the mean. The low level of heterogeneity of the changes in the outcomes across the studies may have limited the power to detect dose–response relationships. The used dose metrics had to be converted from a variety of respective measures leading in several cases to estimated levels of the dose. The quality of the included studies was variable. In particular, the sequence generation, allocation concealment and blinding in the trials was less than adequate in many studies. This may attenuate the precision of the effect sizes, although the direction of the observed effects was consistent. Another weakness concerns the generalisability of the findings. Participants in the studies were mostly healthy but inactive women, so direct applicability to men and individuals with pre-existing chronic disease may be questioned. However, based on recent evidence on the effects of PA on health and on the resulting PA recommendations, there appears very few differences between women and men. Moreover, as 35 of the 38 studies came from Europe, USA, Canada and Australia, the findings may not be applicable to lower-income and middle-income countries. Meta-analysis of data from 37 randomised controlled walking trials revealed significant improvements in seven CVD risk factors: decreases in body mass, BMI, body fat, systolic and diastolic blood pressure, fasting glucose and an increase in VO2max. The effect sizes indicate clinically important improvements in CVD risk profile. There were non-significant effects on six CVD risk factors: waist-to-hip ratio and waist circumference, and in total, HDL and LDL cholesterol and triglycerides. Our meta-regression analyses did not find associations between the observed effects on the CVD risk factors and the frequency, length, bout duration, intensity and volume of the walking training. These results suggest that any walking exposure within the dose range of the included studies is likely to be beneficial for cardiovascular health. Current practice, population health promotion and exercise referral should reflect this. As these controlled intervention studies were designed and implemented for healthy but inactive middle-aged and older women and men, the findings demonstrate the health potential of everyday walking for large segments of populations. Walking still remains firmly a ‘best buy’ for public health. Walking interventions have clinically significant effect on cardiovascular disease risk factors including body mass, body mass index, body fat, systolic and diastolic blood pressure, fasting glucose and an increase in VO2max. Even modest amounts of walking appear to provide health benefit. There is insufficient evidence on the exact volume and pace of walking required for benefit. Clinicians should continue to promote walking among their patients, particularly women and older adults.
. Walking to health. Br J Sports Med 1998;32:184–84.
. Walking, body composition, and blood pressure dose-response in African American and white women. Ethn Dis 2006;16:675.
. Women walking for health and fitness—how much is enough. JAMA Intern Med 1991;266:3295–9.
. Effects of a twelve-week walking programme on maximal and submaximal work output indices in sedentary middle-aged men and women. J Sports Med Phys Fitness 1988;28:59–66.
. Walking program reduces elevated cholesterol in women postmenopause. Can J Cardiol 1995;11:905–12.
. The effect of 24 weeks of moderate intensity walking upon metabolic syndrome risk factors in previously sedentary/low active men. J Exerc Physiol 2011;14.
. Physical training effects on the fitness and habitual activity patterns of elderly women. Arch Phys Med Rehabil 1992;73:603–8.
. Intensity and frequency of physical conditioning as determinants of the cardiovascular response of middle-aged men at rest and during exercise. Pennsylvania State University 1973. American College of Sports Medicine. ACSM’s guidelines for exercise testing and prescription. 9th edn. Philadelphia: Lippincott Williams & Wilkins, 2014:162–77.
. Cochrane handbook for systematic reviews of interventions version 5.1.0, 2011. www.cochrane-handbook.org2011.
. Introduction to meta-analysis. Chichester: John Wiley & Sons, Ltd, 2009.
. MONICA population survey data book: WHO MONICA Project e-publications, 2000.
. Discovering statistics using IBM SPSS statistics. 4th edn. Los Angeles: Sage, 2012.
. Changes in physical fitness and all-cause mortality. A prospective study of healthy and unhealthy men. JAMA 1995;273:1093–8.
. 10 minutes brisk walking each day in mid-life for health benefits and achievement of recommended activity levels—evidence summary . London: Public Health England, 2017. Contributors All authors were involved in the conception or design of the work, or the acquisition, analysis or interpretation of data. PO, PK and MHM conceived the paper, ST, PK and PO carried out the statistical analysis. PO drafted the paper. All authors contributed to all drafts of the paper and approved the final manuscript. Ethics approval Not applicable. Meta-analysis of data from studies that were ethically approved.